I will try to have a giveaway each weekday of this week. Each one will last for a week. So today’s Monday giveaway, Shelby’s Quest (iPad app) will last until Monday, October 29th, 9:00pm Pacific. Please submit one comment saying why you would like to have Shelby’s Quest and enough information that I can contact you, and/or you will need to check back. I will be using a random number generator (ie if there is 41 comments I’d give it the number 41 and it randomly chooses a number 1-41), to determine the winner. – It was developed by Kami Bible, an occupational therapist in a school district in Washington State. 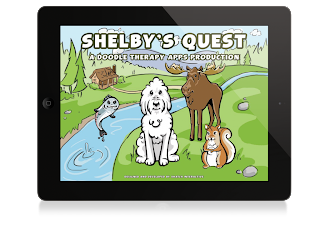 -The main character is a lovable labradoodle named Shelby. -This app is a therapy tool that focuses on fine motor and visual perceptual skills for young children and special needs students. -The best feature is its ability to track data on multiple children or student profiles. -You can view the demo video on YouTube at http://youtu.be/cx8ZS1Ngj2U.